A uniquely produced demineralized water with monatomic, diatomic and nano-clusters of gold. Produced with purified water containing 10ppm (parts-per-million) of negatively charged gold particles varying in size from 0.14 to 4 nano meters. This precise ratio (particle size and ppm) is crucial for maximum absorption of the gold nano-clusters. 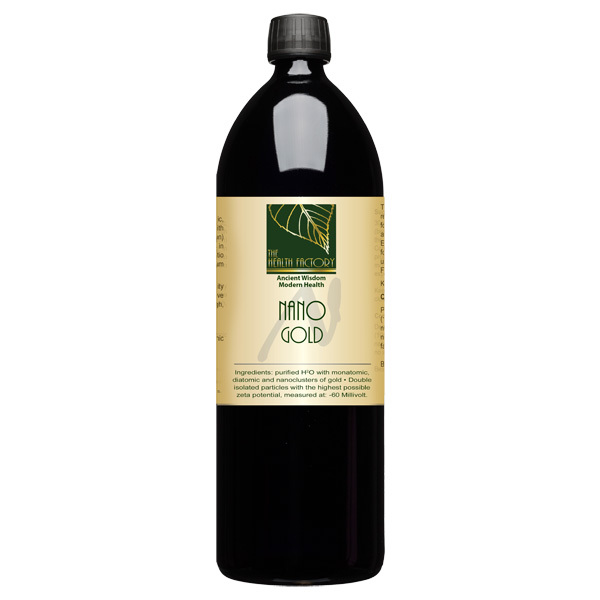 Purified and revitalised water containing 10mg/l (10ppm) monatomic, diatomic and nano-clusters of gold (Aurum). Contains no allergens. 100% bio-available. External use. Can be used by the whole family. Consult with your practitioner regarding any health issue, use of medication or pregnancy. For more information ask the experts at The Health Factory. Keep out of reach of young children. Does not require being stored in the dark (in fact it is better to keep the cap on and leave the bottles in the light). Product should not be diluted.